To make the stuffing, half-fill a medium saucepan with water and bring to the boil. Add the rice and cook for just five minutes. Rinse in a sieve under running water until cold. Drain and set aside. Pour the oil into a large non-stick saucepan and fry the onion over a medium heat for three minutes, stirring until beginning to brown. Add the garlic and cook for two minutes more, stirring. Reduce the heat to low and stir in the hot smoked paprika and the sweet paprika, salt and lots of ground black pepper. Cook for a further minute, stirring constantly, then remove from the hob and tip into a heatproof bowl to cool. While the spiced onions are cooling, prepare the cabbage leaves. Half-fill a large saucepan with 1.2 litres/2pints water and bring to the boil. (You will need this water to make the stock a bit later on.) Remove any really tough or damaged outer leaves from each of the cabbages. Using a small knife, cut the next few leaves away from the stem at the base of the cabbage. You should be able to get around 12 good leaves from each cabbage. Don’t worry about the smaller ones from the heart of the cabbage as they are too tiny to stuff. You can wrap the hearts and keep in the fridge then use as a vegetable accompaniment to another dish. Wash and drain the cabbage leaves and place on a board. Using a small knife, carefully shave a thin sliver off the thickest central vein on the outside of each leaf. This will help the leaves roll. Blanch the leaves in 2-3 batches in the boiling water for five minutes. Remove with a slotted spoon and rinse in a colander under running water until cold. Drain and place in a bowl until the stuffing is ready. Stir the stock cube into the cooking water in the saucepan until dissolved then pour into a large measuring jug. To finishing the stuffing, mix the rice, pork mince, chopped parsley and lots of seasoning into the spiced onions with your hands until thoroughly combined. Place one of the blanched cabbages leaves on a board with the inner part of the leaf facing upwards. Take a small handful of the pork stuffing and roll into a stubby sausage shape. Place at the base of the leaf and roll once. Tuck in the left hand side of the leaf and continue rolling to the top of the leaf. The right-hand side of the leaf can then be tucked in to secure the parcel. Repeat with all the other leaves and stuffing. 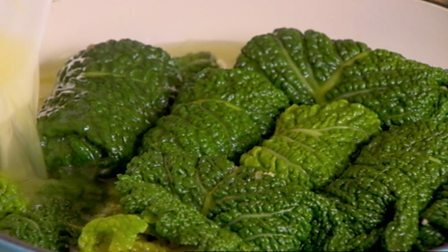 Place the stuffed cabbage leaves fairly snuggly in a large saucepan or flameproof casserole – they will need to be in at least two layers. Pour the reserved chicken stock over the top, until it almost covers the pork parcels. Bring the stock to the boil and then reduce the heat. Cover the pan with a tight-fitting lid and leave to simmer gently for 45 minutes, or until the pork and rice are cooked and tender. While the stuffed cabbage leaves are cooking, prepare the tomato sauce. Heat the oil in a large non-stick frying pan and gently fry the sliced onions for five minutes, or until softened and beginning to brown, stirring regularly. Add the garlic and cook for two minutes more, stirring. Tip the tomatoes into the pan, add the tomato purée and sugar. Fill the tomato can with cold water and stir into the pan (you’ll need around 400ml/14fl oz water). Bring the sauce to a gentle simmer and cook for 25 minutes, stirring occasionally, until thick. Remove from the heat and leave to stand. When the stuffed leaves have finished cooking, take off the lid and scoop four ladlefuls of the cooking liquor into the pan with the tomato sauce. Bring the sauce to the boil and cook for 2-3 minutes, or until well reduced and thick once more, stirring regularly. While the sauce is simmering, use tongs to transfer the stuffed cabbage leaves to a large warmed platter or ovenproof dish. Pour the hot tomato sauce over the top. Spoon half of the soured cream over the tomato sauce and sprinkle with a little paprika. The stuffed cabbage leaves can be served with sauerkraut and the remaining soured cream to taste.